US, Georgia I am adding some new ciruits to add some additional outlets. The closest place is to run a wire to the main panel box. My question is, can I connect more than one wire to a breaker and still meet code or do I need to get a new breaker. Both the wires and plugs are the same rating as the breaker - 15 amp. 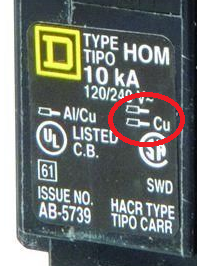 Making the assumption that only one wire can be under each screw in the breaker, can I make a junction in the panel box? IE, one wire to breaker, but two wires to a wire nut connecting them together, or does the junction need to be in a separate box? There should only be one wire per screw terminal. One of my wiring books says that some local codes allow splices inside a service panel, and some don't, so you should check with your local authority to make sure it's OK in your area. However, regular circuit breakers are only a few dollars, so even if it's allowed in your area, my advice would be to just install the extra breakers for the new circuits. With most devices you can only have one wire per screw terminal, however, some breakers do support multiple wires under terminals. If the device allows multiple taps, it must be listed for the purpose. Feed throughs, taps, and splices are allowed, but only if they do not over fill the enclosure. 312.8 Enclosures for Switches or Overcurrent Devices. Enclosures for switches or overcurrent devices shall not be used as junction boxes, auxiliary gutters, or raceways for conductors feeding through or tapping off to other switches or overcurrent devices, unless adequate space for this purpose is provided. The conductors shall not fill the wiring space at any cross section to more than 40 percent of the cross-sectional area of the space, and the conductors, splices, and taps shall not fill the wiring space at any cross section to more than 75 percent of the cross-sectional area of that space. If you have no room for a new breaker in the panel, consider a Tandem Breaker. You'll have to check whether or not your panel supports them, but in some cases a tandem breaker can save you from having to install a new panel or a sub-panel. In the 2008 version of the National Electrical Code (NEC), section 210.12 has been updated to require Arc-Fault Circuit-Interrupter (AFCI) protection in many areas of the home. Depending on the changes you're making to the wiring, the inspector may require you to update the breaker for this or all branch circuits feeding these areas. This decision will be completely up to the Authority Having Jurisdiction (AHJ), since it's a judgment call on whether or not you're making a large enough change to warrant the extra work. If you want to connect two load wires to a breaker, you must use a breaker that is "labeled and listed" for two wires. Otherwise a wirenut connecting two circuits to a pigtail should be ok, as it is not a "circuit passing through" which would fall under the prohibited junction box usage. A Tandem Breaker is of course the best solution, as long as you comply with the number of breakers for which the panelboard was designed, rated, and listed, since you won't have to worry about how much amperage you can take from the existing circuit. Not the answer you're looking for? Browse other questions tagged electrical circuit-breaker code-compliance or ask your own question. Can I feed two circuits from one breaker? How can I safely extend a wire in my electrical panel? Swapping wires in electrical panel to move outlets to different phase of service. Is this safe?